In 2003 Honda ran this campaign in English magazines. It was the latest in a string of strange executions clearly aimed at showing how creative they are, how car makers can sometimes think outside the box, how dreaming can also be part and parcel of the automotive business. I will give them 10 out of 10 for being brave. Like a number of car companies since, they dare to be different. And let’s face it, advertising a car company without showing a car is brave. But replacing a car with a BANANA?! My major problem with this ad is not the concept, but the copy (the text for the ad), which I transcribe here. Oh dear. Well, having shown this ad to a number of MBA courses, and criticised it, I suddenly realised last year I’d better take it out of my notes. My company car is now a Honda. But you know what? I hadn’t made the connection. Maybe branding is more subliminal than I thought. Or maybe I got my car despite this ad. Or precisely because of it? This entry was posted in Desire, Ponderings and tagged Honda. Bookmark the permalink. I find really interesting that the ad lost you in the first two lines yet, you finished reading it, saved it, showed it in a number of MBA courses and wrote a blog post about it. The ad stop running 6 years ago and you’ve kept it alive. If you ask me. Job done. 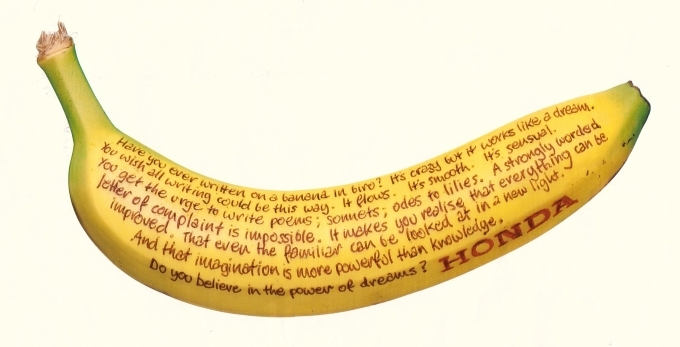 I have never forgotten the ad, and I had never written on a Banana…… just about to use it, somehow, not sure how yet, with some students as part of a Personal Philosophy course??? As Javie said Job Done.